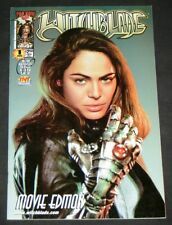 WITCHBLADE: MOVIE EDITION #1 PHOTO COVER, Top Cow/Image 2000 - Michael Turner! WITCHBLADE: MOVIE EDITION #1 Exclusive Photo Cover - Michael Turner Art! WITCHBLADE: MOVIE EDITION #1 (Vol. 3) - CGC Graded 9.8 - Photo cover! This page was last updated: 25-Apr 11:08. Number of bids and bid amounts may be slightly out of date. See each listing for international shipping options and costs.